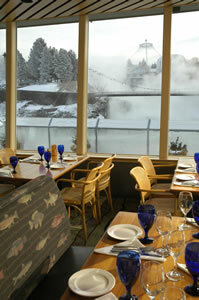 Fish, falls, taste and view. 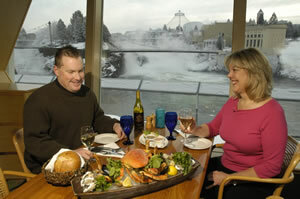 With its impressive setting right on the banks of the Spokane River’s upper falls and featuring a fresh Northwest seafood menu, Anthony’s is a quintessential Spokane restaurant. Lunch and dinner are served up daily with style and taste. The large windows offer almost every seat in the house a dynamic view of the rushing river and basalt rock channels carved by water over centuries of time. The 8,600-square-foot, 244-seat restaurant specializes in Northwest seafood and produce. From it’s signature dishes like Crispy Coconut Prawns and Dungeness Crab Cakes to its rich, clam-full chowder, fresh and tasteful are the words of the day. Anthony's serves nothing but wild salmon with no farm-raised catch in the kitchen. Fresh, hot sourdough bread compliments the meal. Fresh seasonal salads feature local ingredients and savory flavors. Different fruit themes are offered throughout the year with NW huckleberries being a favorite. For the flavor accent in salads, sauces and deserts, huckleberries are the prided wild fruit of the area. 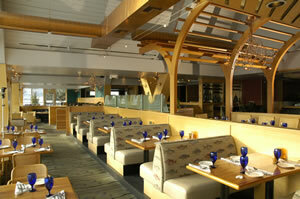 The good-sized Banquet Room resides under a huge shimmering school of hanging metal salmon. The carpet here leaps with fish underfoot and a metal backed speaker enclave presents the perfect setting for an important presentation. 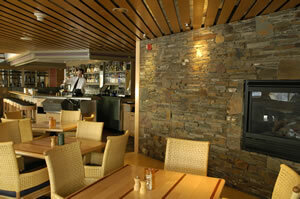 Outdoor dining on the deck is available during the warm weather months and puts you right above the flowing river. Sorry no fishing allowed…you couldn’t ask for fresher fish then is already on the plate in front of you! Anthony's Sunset Dinners ~ A local Favorite! Monday through Friday, until 6:00 p.m.
chowder or salad, entree and dessert.